In a game where the Dallas Stars misfired on several great opportunities, the Stars got a pair of goals from Erik Cole and two assists from Alex Goligoski to hand the Nashville Predators a 4-1 defeat at American Airlines Center. Dallas (19-12-6, 44 points) not only won its second straight game but the Stars also kicked off their five-game homestand on a very positive note. "It’s very important (to start off this homestand like this)," Cole said. "It has been tough to find any rhythm here. We haven’t had a lot of home games consecutively. I thought it was a great start when (Jamie Benn) made that great play. It set the tone." Kari Lehtonen stopped 33 of the 34 Nashville shots he faced to earn his 15th win of the season. Stars head coach Lindy Ruff extolled the virtues of team defense after Fridayâs win. "I think it’s real important," Ruff said. "We talked about it as a team four or five games ago. You’ve got to give our forwards a lot of credit for getting in shot lanes and blocking shots." The Stars wasted no time in taking control of the game as captain Jamie Benn netted his 12th of the season just 42 seconds in to give the 17,197 at the American Airlines Center plenty to cheer about early on. "Well, weâve been giving up a lot of early goals lately and I canât blame the goaltenders tonight," Predators head coach Barry Trotz said. "Carter (Hutton) was pretty decent tonight but in the last few games, it has been (an issue)." However, Antoine Roussel missed on a penalty shot late in the first period and Stars rookie sensation Valeri Nichushkin hit a post early in the second, leaving the door open for the visiting Predators to tie the game. And thatâs exactly what Nashville did at 7:14 of the second when defenseman Kevin Klein scored his first of the season to make it a tie game at 1-1. But that lead would last all of 24 seconds as Cole beat Predators goaltender Carter Hutton with a wrister from the right circle at 7:38 to make it 2-1. Hutton was screened on the goal by Stars rookie center Colton Sceviour. "Those first shifts after goals either way are important," Benn said. 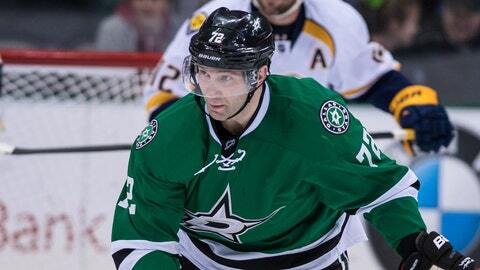 "(Rich) Peverley, (Colton) Sceviour and (Erik) Cole stepped up." Cole then lit the lamp again with about six minutes left in the middle period when he outsmarted Hutton by stopping outside the Preds crease, forcing the Nashville netminder to the ice. Cole then coolly slipped the puck inside the right post with a backhand to make it 3-1. Dallas then went ahead 4-1 about four minutes into the final 20 minutes when Ryan Garbutt netted his sixth of the season to give the Stars a bit more breathing room. The Stars return to the ice on Sunday afternoon against the St. Louis Blues, a game which will mark the first appearance in Dallas for former Stars captain Brenden Morrow, who is now with St. Louis. Dallas has already faced the Blues once this season, losing to the denizens of the Gateway City 6-1 back on Nov. 23, a result the Stars captain remembers well. "They gave us a pretty good spanking," Benn admitted. "We haven’t forgot about it."